Brink takes place on the Ark, a man-made floating city that is on the brink of all-out civil war. Which side will you choose?. Title: BRINK. Format: PlayStation 3. Bookmark Us. United Kingdom. This item is in excellent condition. The disc is in excellent condition. Disc itself is in excellent condition - no scratches or scuffs. Manual also excellent. Publisher Bethesda. Tech Details. Genre Shooter. Platform Sony PlayStation 3. In great condition complete with instruction manual. Kind regards Ali. We will always work with you to resolve any issues. Brink -- Special Edition steelbook incredibly hard to get in this condition. (Sony PlayStation 3, 2011). Condition is Like New. Dispatched with Royal Mail 1st Class Large Letter. Region: Region Free. Dispatch and Handling. Need to get in touch?. Brink (Sony PlayStation 3, 2011) - European Version. CONDITION: New Sealed - complete with booklet, disc, box. TESTED: All my sale item are either tested or new. Brink (Sony PlayStation 3, 2011) - European Version. Condition is Good. Dispatched with Royal Mail 1st Class Large Letter. Brink -- Special Edition (Sony PlayStation 3, 2011). Condition is Like New. Dispatched with Royal Mail 1st Class Large Letter. Case and CD in like new condition. Includes booklet. Sony PlayStation 3. If the item is listed as used, your item will be previously owned but still in great condition. The disc will play perfectly without interruption. Case, inlay notes and sleeve may show limited signs of wear or may not be included. Feature 1 : playstation 3. Platform : PlayStation 3. Condition : Very Good. UPC : 093155142527. Genre : Action. Part # : Unknown. Brink (Sony PlayStation 3, 2011) - European Version. Condition is Like New. Dispatched with Royal Mail 2nd Class Large Letter. Includes Bandana accessory. New And Sealed. Dualshock 3 Vibration function. Network Features. Network players 2-16. Complete in box with manual. Brink PlayStation 3 game . Condition is Very Good. Dispatched with Royal Mail 1st Class Large Letter. 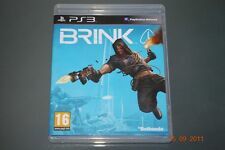 Brink (unsealed) - PS3 UK Release New! Disc and all components remain flawless. Official UK Release. 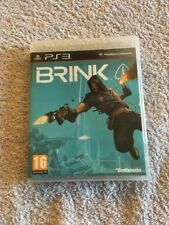 4.5 out of 5 stars - Brink (unsealed) - PS3 UK Release New! 7 product ratings7 product ratings - Brink (unsealed) - PS3 UK Release New! Case is a little scuffed, Disc and instruction manual is. THE ARK, ONCE OCEANIC PARADISE, HAS BEEN TORN APART BY CIVIL WAR. NOW YOU MUST JOIN THE RESISTANCE OR SECURITY FACTION. 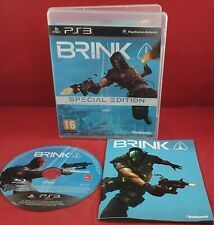 PS3 GAME BRINK with Booklet (2011) (UK Pal Region 2). 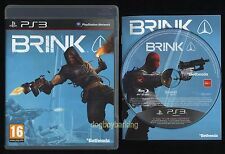 4.5 out of 5 stars - PS3 GAME BRINK with Booklet (2011) (UK Pal Region 2). 7 product ratings7 product ratings - PS3 GAME BRINK with Booklet (2011) (UK Pal Region 2). Brink Promo copy for the PS3. This is just the disc. Uk and paypal only please. Check out my other items. Brink Video Game for Sony Playstation 3 - DISC ONLY MINT CONDITION!